The Big Apple. Gotham. The City that Never Sleeps. Whatever you call it, New York has emerged as a premier coffee destination. In previous years New Yorkers were notorious for drinking their coffee cheap and fast. But today New York is no longer a johnny-come-lately in the craft coffee scene. Just a cursory glance at the New York Times coffee map reveals one doesn’t have to walk more than a few blocks to get a decent cup in lower Manhattan or Brooklyn. For someone plotting an NYC cafe crawl, the choices can be overwhelming. 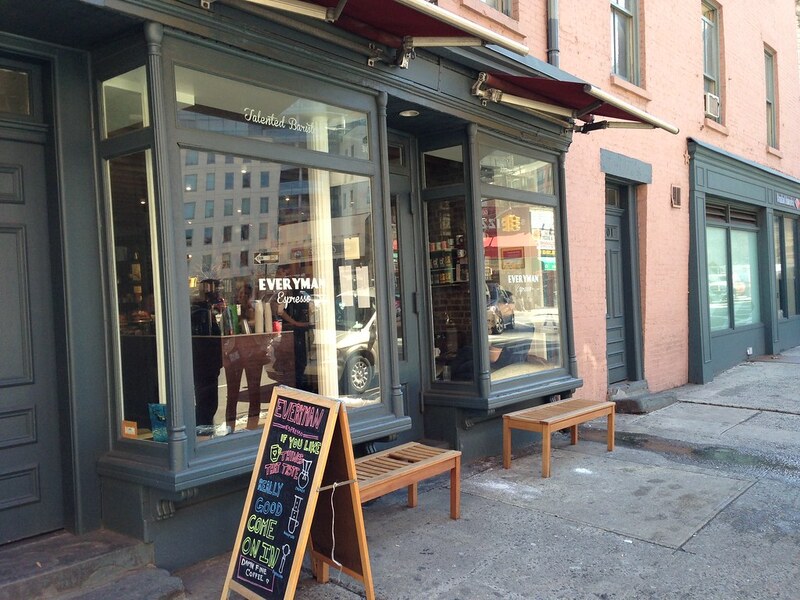 Thankfully, everyone I polled was unanimous: go to Everyman Espresso in SoHo first. For the past seven years Everyman has been churning out specialty coffee in the lobby of the Classic Stage Company. The postage stamp sized bar has redefined most baristas’ concept of personal space, but the quality of the drinks and the service has drawn more than just theater lovers to this East Village cafe. Perhaps Everyman’s biggest mark on the NY coffee scene has been owner Sam Penix’s iconic knuckle tattoo, which the New York Times featured in this ground-breaking article. Now, fittingly, the tat adorns the front door of the new Everyman Espresso in SoHo. When Sam Penix and right-hand man Sam Lewontin opened up Everyman SoHo in 2012, they wanted to design a bar with perfect work flow. Every piece of equipment is thoughtfully placed to optimize productivity. The attention to detail shines through: there’s a tap for sparkling water (served with each espresso), the Mazzer Robur grinders have a custom hot rod finish, and fresh flowers in an old Chemex grace the island. In many ways, visiting Everyman Soho feels like walking into your own kitchen, although your kitchen probably doesn’t have a three group head La Marzocco Strada or a Marco water tower. When I visited, Everyman was pulling shots of Counter Culture’s Mpemba Burundi. I had the Mpemba as a filter coffee before, and was excited to try it as an espresso, especially considering Sam Lewontin recently used it to win the NERBC. It took me all of 2 sips to finish this wonderfully sweet and balanced shot. 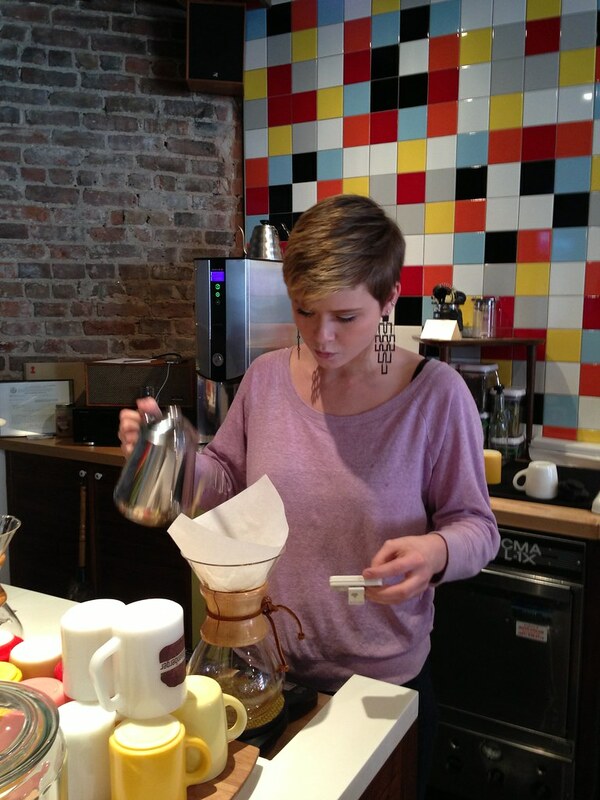 Next I shared a Chemex of the Tairora Project: Bonta Microlot from the Eastern Highlands of Papua New Guinea. This tea-like, heirloom varietal will destroy any prejudice you might have towards Pacific Island coffees. The cup was clean with a fig-like sweetness. Roasted to perfection by Counter Culture, immaculately brewed by Everyman. Everyman also excelled in customer service. Often times big-city baristas aren’t interested in conversation. Their job is to brew coffee, not to talk about it. But the baristas at Everyman are keen to chat with anyone interested and went out of their way to make my friends and I feel welcomed. In a city with a lot of great coffee, this really sets this shop apart. In short, Everyman SoHo is the complete package: stunning space, incredible coffees, and wonderful service. If I only had enough time for one cafe in New York, I would make it this one.